Typhoon's latest drysuit that features a hinge zip around the waist making it easier to get in and out of. Since Typhoon came up with the brilliant design for the Multisport Drysuit with the Hinge Zip around the waist, many more of us have found it a great deal easier to get in and out of our drysuits. All the protection we have come to expect from Typhoon but with an entry system that is so easy to use. The new Multisport 5 Hinge features a great design with built-in fabric socks, latex wrist gaskets and a comfortable neoprene neck seal that glides over the head and doesn’t pinch like a latex one can. Plastic waist hinge entry and relief zips come as standard and they have even changed the old colour to a bright and easily visible yellow. This makes the Multisport 5 hinge a good option for kayak fishing at sea or anyone who just wants to be seen. The Typhoon Multisport 5 Hinge is available for delivery thoughout England, Wales, Scotland, Northern Ireland & Ireland. Canoes and kayaks are normally supplied within 3-5 working days. 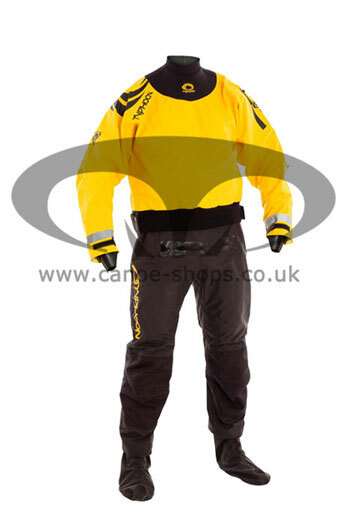 Clothing and equipment are normally delivered within 1-3 days. The Typhoon Multisport 5 Hinge is available for instore collection from Norfolk Canoes or from any branch within the Canoe Shops Group.